Each year, the delightful south of France towns of Juan-les-Pins and Antibes ring to the sounds of jazz. The festival in Juan, which always takes place in July, has been going since 1960 when luminaries of the jazz world such as Charles Mingus, Eric Dolphy, Guy Pedersen, Stéphane Grapelli and Sister Rosetta Tharpe filled the arena. Since then, all the great names of jazz have performed here from Ella Fitzgerald to Miles Davis, Oscar Peterson to Nina Simone. It’s the oldest European jazz festival and has kept its lustre and fame through the years. The line-up has altered over the years to take in different music styles and to attract a new audience (which in 2014 reached 50,000 from 33 different countries), with country singers like Betty Carter appearing, as well as Carlos Santana with his fusion of rock and Latin American sounds, the eclectic singer, drummer and producer Phil Collins, singer Tom Jones and the London Community Gospel Choir. The setting in the Pinède Gould gardens is magical, with the stage set on the edge of the Mediterranean sea and the spectators in banks of seating or in ground seats facing the performers against the backdrop of the bay. Get tickets on the stands for the best views of the musicians and the surrounds. Concerts start in the light at 8.30pm. 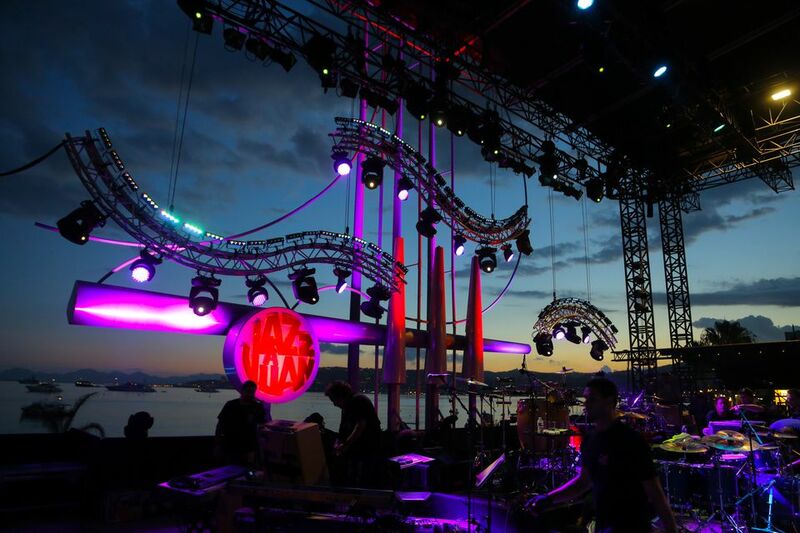 There are usually 3 acts during the evening as night gradually falls and the lights of Juan-les-Pins, Golfe-Juan and Cannes gradually transform the scene. The festival always takes place over or very near Bastille Day, July 14th, which is celebrated with some spectacular fireworks displays. Don’t worry if you miss the 14th and all its surrounding events; the French celebrate over a 3-day period. The concerts on the main stage end around 11.30pm after which there's a jam session on the beach. It’s on Les Plage Les Ambassadeurs (part of the neighbouring Marriott hotel) with one musician playing throughout the after-hours festival, joined by performers from each evening concert. It’s a wonderful ending to the day. Entrance is free, but you’re expected to buy drinks if you want to sit in one of the comfortable chairs that make up this al fresco setting. As part of the festival, the regular Off performances take place in different places. In Juan-les-Pins there’s a small stage set up opposite the main festival site in the Petit Pinède park with tiered seating. But there are plenty of places to sit on the grass nearby, watch and listen. Performances take place from 6.30 to 7.30pm each night. Every day, there’s a parade of marching bands through the streets of Juan-les-Pins, Vallauris or Golfe Juan. The event takes its inspiration from the great Sidney Bechet who started the idea in the 1950s. Bechet originally came to France with the Revue Nègre in 1925 (the group which included Josephine Baker). He settled in France finally in 1950, marrying Elisabeth Ziegler in Antibes in 1951. In Antibes, the Place de Gaulle fills up from 6 to 7pm with different groups and singers. You can either sit in the middle of the square, or take a seat on the terrace of any of the cafes surrounding the square for a drink or a meal. There are plenty of restaurants, cafes and bars in both Juan-les-Pins and Antibes but if you miss those, there are small bars and places to buy sandwiches and snacks once you’re in the arena. There’s also a boutique for festival souvenirs. Get information on the festival from either the tourist office and its website, or from the Jazz a Juan website. Tickets cost from 13 to 75 euros depending on the performers and the location of your seating. You can buy online at www.jazzajuan.com, www.antibesjuanlespins.com or from the tourist offices in Antibes and Juan-les-Pins (see addresses above).